One of Our 50 Is Found! A-Ha! Moments when our readers realized that New Mexico was the place for them. We trundled down the muddy, rutted road in the middle of nowhere, fleeing the gathering thunderstorm as bursts of lightning exposed the surrealistic outlines of mesas and hoodoos in the twilight. The dim yellow headlights of our 20-year-old pickup revealed the occasional glimpse of painted horses roaming wild-eyed and free across the landscape, manes tangled and glistening in the summer rain. It was 1996, and we were on a hurried cross-country journey, moving the truck and camper from California to Tennessee for my work. It was also the first time my wife and I had escaped together for a few precious days from the rigors of raising three children in Texas. Chaco Canyon was number one on my list of “must-sees” for this trip. 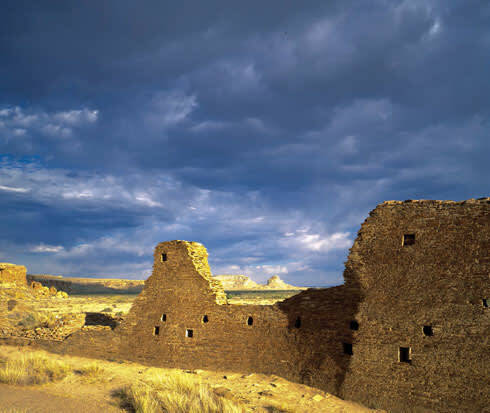 Two decades earlier, while attending college in North Carolina, I happened to read about the recent discovery of the Anasazi Sun Dagger on Fajada Butte in Chaco Canyon. I was overcome with a deep yearning to visit Chaco someday. We camped in Chaco Canyon just for the night, slowing down the pace of our trip for a moment, and celebrating the passion of the place as thunder echoed around the canyon, feeling that we would return to New Mexico some fine day for a proper exploration. July 4, 2004, was the day we left Texas to make New Mexico our home for good. We’ve been back to Chaco many times since. We were privileged to attend a lecture that Anna Sofaer, the discoverer of the Sun Dagger, gave in Santa Fe a few years ago. The black and white Saddlebred my wife fell in love with last year is now named Chaco, in honor of those muddy horses we saw all those years ago. We are truly enchanted by New Mexico. Living here, not a day goes by when we don’t acknowledge how fortune has smiled on us by allowing us to call New Mexico home. The most recent experience of cherishing the power of New Mexico’s hold on my imagination was when I attended the opening-day screening of The Lone Ranger last summer. My wife has a small role early in the film, playing a temperance woman. She spent many days dressed in a hoop skirt and several layers of wool, riding a train around and around in the heat, blowing dust, and stark beauty of Río Puerco Valley. Her five seconds of screen-time fame quickly came and went, but the radiance of New Mexico’s scenery lingered in my mind for days. The radiant landscape of our state was on display, from distant views of the Puerco’s otherworldly volcanic plugs to the final scene when Tonto and the Lone Ranger ride away from Tse Bit’a’i or Rock with Wings (also called Ship Rock). Too bad that some critics didn’t seem to care for the movie, but my family and friends loved it. I’m an enrolled member of the Cherokee Nation, and it helped me to know that Johnny Depp’s performance was embraced by the Comanches. In the early 1980s, I drove from the Midwest through New Mexico on my way to California. I was starting over and had no clue about what would happen to me. I was driving on the Turquoise Trail, as I had decided to take a detour to Albuquerque. There I was, driving on the loveliest section of road I’d ever seen … rough but beautiful. All of a sudden a song came on the radio: “God Bless the Child.” I turned up the volume and rolled down the windows. I sang at the top of my lungs. New Mexico had understood and embraced me! I’ve been back to this amazing place several times since. I always feel like I am returning home. In a world of change, I found a place of timelessness. It was early 1960 when I spent several months at the Presbyterian Hospital in Embudo working as a nurse’s aide. I was a student at the University of Minnesota, seeking my own mission in life. Although I didn’t become a nurse, my time in New Mexico remained significant. Fast-forward to 2004. I was still in Minnesota, but returned to Taos with my daughter, who would eventually relocate there. Approaching Embudo Valley, I wondered how the present reality would compare to 50-year-old memories. I was thrilled to see the hospital building still there. The landscape of the valley was unchanged, and I rejoiced that something in life could be eternal. My fascination with New Mexico was rekindled! The embers keep glowing and turn to flames during my now annual visits.